Sorry for the long absence, guys! I haven't been feeling very creative lately, plus I had other things to worry about in my life.. plus I kept breaking nails, ugh! Anyway.. with the weather getting a little nicer, I've been feeling spring-y, and wanted something bright and simple. I love sunflowers, so I figured hey, why not! They didn't really turn out too great, but I'm giving myself a pass this time since I haven't done any nail art in a while. Besides, I like the color combo. 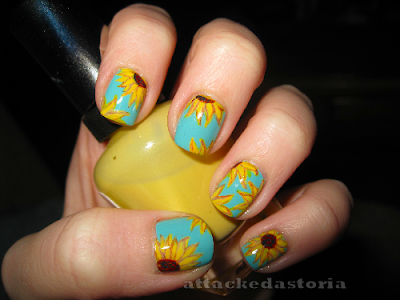 I used For Audrey as the base, then acrylics for the art, since my yellow polishes weren't opaque enough. I think it looks cool! A lot of details.. So thumbs up! Wow, those are seriously gorgeous! I love the colors. I love this design too! I'd also love to see a tutorial! i so much love this nail art? could you do a to do/tutorial or something?